NEET Analysis 2019: The National Testing Agency (NTA) will be conducting NEET 2019 on May 5, 2019, for 63985 MBBS and BDS seats in medical colleges all over India. Embibe will provide the in-depth NEET Analysis here which will give detailed insights into the paper – the overall and sectional level of difficulty, distribution of questions, ideal time, type of questions asked, important topics, etc. The NEET Analysis will give students an idea about how they have performed in the exam, which, in turn, will help them predict their chances of making it to their dream college. Read on to find the overall NEET Analysis and in-depth NEET Analysis by Embibe. Candidates will be able to download OMR answer sheet of NEET 2019 in the second week of May 2019. The NEET Results 2019 is likely to be announced on June 5, 2019. According to the NEET Analysis, NEET 2018 paper was considered as easy to moderate with about 150 questions based on NCERT and about 30 questions were found tricky as interlinking two/more topics. Biology was found to be the easiest of all, Chemistry was easy to moderate while students found Physics toughest. Qualifying marks will likely be around 140 while marks required to take admissions in government colleges may be about 490 which may vary from one state to another state depending on the numbers of seats of state quotas (85%). Physics is the toughest of the three subjects. Class XI syllabus was given more weightage in NEET 2018. A lot of questions came from class XI Mechanics, Modern Physics and Electrodynamics. There were 8 difficult, 27 medium level and 10 easy questions from this section. Mechanics and Magnetism are usually the most important topics that carry the maximum weightage. Unlike Physics, Chemistry had more questions from the class XII syllabus. For many years, Inorganic Chemistry had the highest weightage but last year maximum questions were from Organic Chemistry. The questions from Class XI were not very tough but the ones from Class XII were quite tricky. Most of the questions were conceptual and application-based so candidates must have total clarity about the basic concepts. Embibe has the ability to perform a unique NEET Analysis of the 2018 offline paper. Having large amounts of student attempt data collected on our platform over many years, and using Embibe’s Knowledge Graph gives us insights into the paper on various dimensions – difficulty, time to solve, important concepts and chapters, and likely student mistakes. Our enormous chest of data allows us to generate question packs that students can use to engage in highly targeted practice for any exam. For instance, our NEET Revision Digest Jump question pack which includes 1000 questions of high importance to the NEET exam, covers over 95.57% of the concepts that were tested in this year’s paper! In-depth NEET Analysis | How difficult was the paper? Questions are rated on a difficulty scale of 1-10 (with 1 being least difficult and 10 being highest difficult) specific to an exam. The box plot below shows the distribution of difficulty levels of questions in this year’s paper versus those from the previous two years. We can see that this year, the average difficulty level was slightly higher than the previous years. 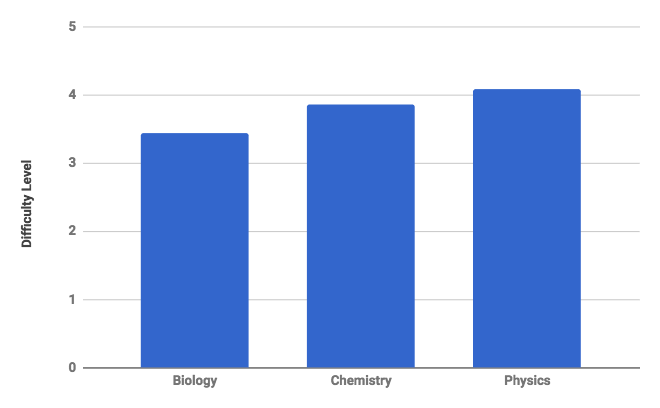 The bar chart below shows the average difficulty level for each of the three subjects – Biology, Chemistry, and Physics. We can see that this year, Physics was on average the toughest section. In-depth NEET Analysis | How long was the paper? Questions are also assigned an Ideal Time (the average time it would take top students to correctly answer the question). For this year’s NEET Offline Paper, the questions had an average ideal time of 63 seconds. 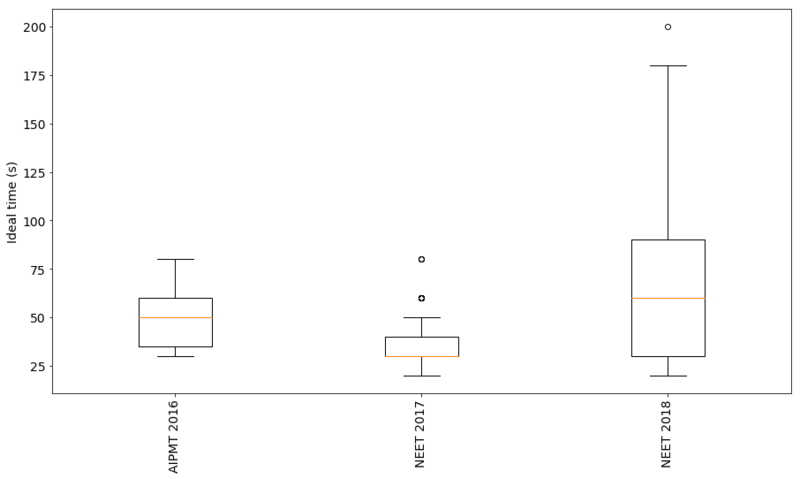 The figure below shows the distribution of ideal times for questions in this year’s paper versus the previous two years. We immediately notice that this year’s paper is much lengthier than previous years. 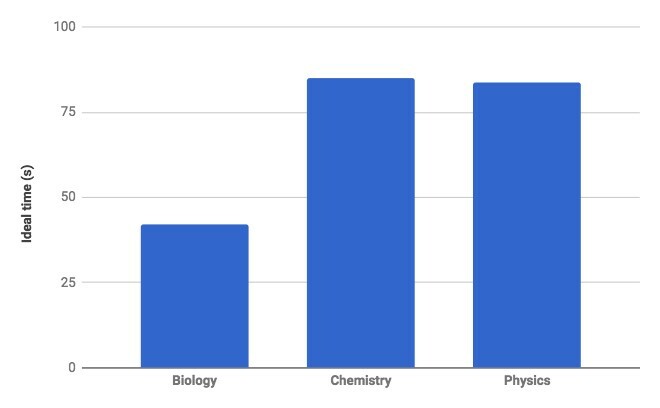 The bar chart below shows the average question ideal time for each of the three subjects – Biology, Chemistry, and Physics. We can see that this year, Physics and Chemistry questions were taking more time. In-depth NEET Analysis | How were the questions spread across chapters and concepts? In total, the 180 questions in this year’s NEET Offline Paper covered 79 chapters from Physics, Chemistry, and Biology. 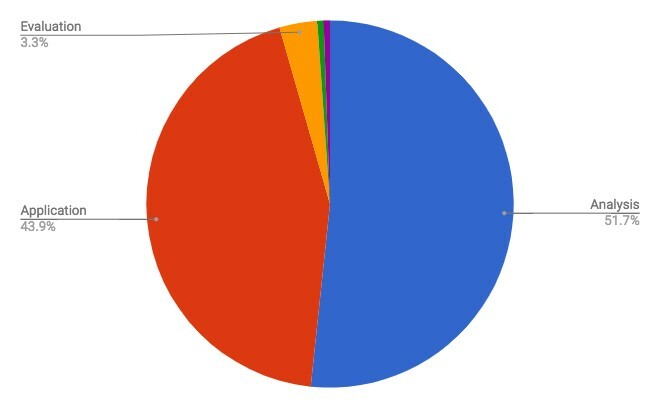 The figure below shows how many chapters were used in multiple questions this year. 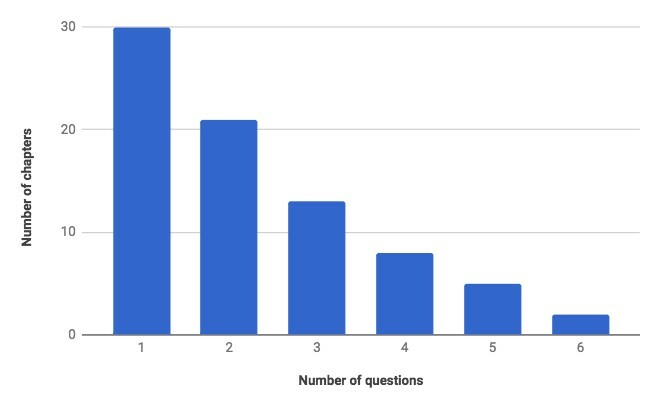 We can see that of the 79 chapters that were tested this year, 15 chapters had 4 or more questions asked. Each question also requires the knowledge of some set of concepts to solve them. There were 383 concepts covered in this year’s paper. This means that on average, a student would have to draw from their knowledge of between 2 and 3 concepts in order to solve a single question. Looking at this data another way, the figure below shows how many concepts were used in multiple questions this year. We can see that of the 203 concepts that were tested this year, only 20 concepts, less than 10%, appeared in multiple questions. And here is the list of concepts appearing in multiple questions. In-depth NEET Analysis | What skill types did the questions test for? Any particular question on an exam paper will require the application of different skill types to be able to correctly solve it within an acceptable amount of time. We tag every question with the specific skill type that it tests for. 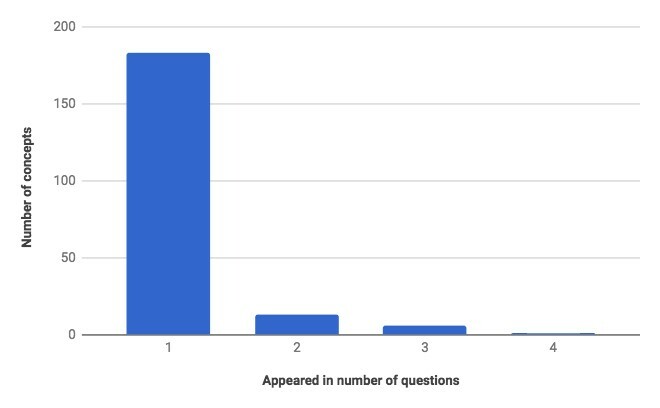 The figure below shows the distribution of skills that were covered by the questions in this year’s paper. We can see that Analysis and Application skill types accounted for over 95% of the questions asked, with Analysis type questions being more abundant. In-depth NEET Analysis | What concepts will students not do well in this year? At Embibe, we have powerful data that captures how students perform on various concepts. This data is based on millions of student attempts collected over the years on our platform. Using this data, we have the following concepts where students will most likely go wrong, most likely go overtime, and most likely make careless mistakes this year. At Embibe, we have always believed that good data coupled with smart algorithms is the key to personalizing education at scale and enabling students to achieve their learning outcomes. The final section in our NEET Analysis drives from this point. It may not be possible for all students to love the entire syllabus as a whole and prepare with equal fervour across all content. However, one must prepare for the exam in the smartest possible manner. Using Embibe’s data-driven insights and preparation strategies make it possible for anyone to make the best use of the limited time available when preparing for some of the toughest exams in the world. 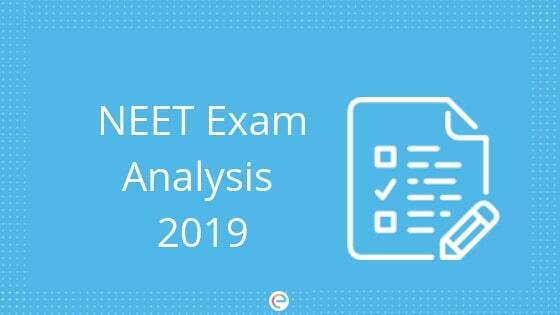 Bookmark this page to get an overall NEET Analysis 2019 once the exam is over. We hope this detailed article on NEET Analysis helps you. If you have any query regarding NEET Analysis, feel free to drop a comment below, and we will get back to you. Trying to get admission into one of these colleges? Simran, as per the latest update there will be no category wise merit list will declare. There will be only a centralized merit list for all the NEET 2018 qualified candidates.